P7.62 led screen is ideally suited for indoor applications requiring close and medium viewing distance. 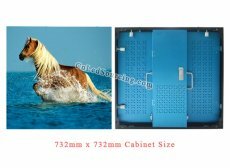 The best price with good quality above is based on per panel size of 732mm x 732mm, FOB Shenzhen terms, and it is not included with receiving card. -User friendly software operation, all programs can be digitally edited. S-Video, VGA; RGB, Composite Video, SDI, etc.